You don't need any fancy equipment to wind your yarn into a center pull ball. All you need is a toilet paper or paper towel tube cut to a comfortable size, and your own two hands. Take the tail of your yarn and drop it down the tube until it pokes out the other end. Hold it in place until you have wrapped the yarn a few times. Just start winding the yarn around the tube. Wrap at an angle after the first few wraps, turning the tube every so often. Keep going until you have wound all of the yarn around the tube. 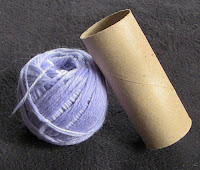 Then, pull the tail out of the center of the tube, and slide the tube out of the ball of yarn. And there you have your very own center pull ball of yarn! Here is a short video showing how it is done. Happy Winding!